Neil Coleman presents a cheque, part proceeds from his recently published book on the history of Ballymena United, to John Anderson, of Ballymena United Youth Academy. 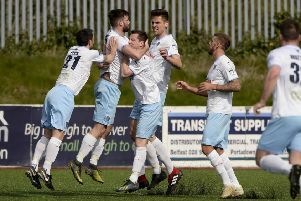 Ballymena United Youth Academy recently received a welcome pre-Christmas financial boost. It came from supporter and former club official Neil Coleman, who donated half the proceeds from the sales of his recently published book ‘Ballymena United Football Club - The Official History’. Neil presented a cheque to United Youth Academy official John Anderson at the club’s recent corporate lunch. “It was important for me that the money raised went to something tangible and John has agreed that it will be used to educate the youth coaches through their qualifications to help improve young players at our club in the long term,” said Neil. “I’m proud to have been able to use the history of our great club to hopefully benefit the future. “Thanks to all who have supported this project from the start and to those that have bought the book, it’s been greatly appreciated,” added Neil.